My pack started off the new year with a walk at Seward Park on Lake Washington. Since it was a rainy Sunday afternoon and the Seahawks were playing football on TV, we pretty much had the place to ourselves. My pal Charlie came with us, and when we first drove into the parking lot, I dragged him away from the car towards the lake before Mike had gotten out of the car. That’s how we just happened to be passing the spot where a woman had just pulled her elderly Newfoundland from the water with the help of a kindhearted passerby. As the woman struggled to lead the stumbling wet dog away, I alerted Charlie that she had left her iPhone behind on the shoreline. Charlie yelled, “Excuse me, is this your phone?” and she ran back to get it while Mike and Heather talked to her dog. She was very grateful, but unfortunately she did not give me any reward, not even one lousy Charlee Bear. And that wasn’t even my most exciting walk of the week! 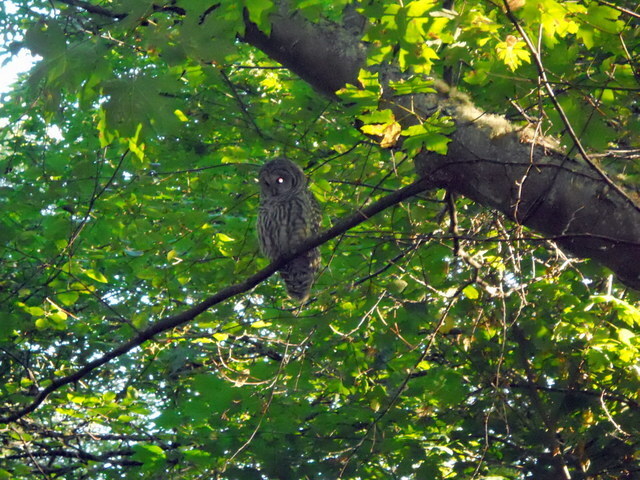 Longtime readers may remember my earlier tete a tete with a barred owl that frequents Discovery Park, and we had heard reports that he and his aggressive ways had returned. We finally ran into him last week in his usual roost near the Visitors’ Center. Heather noticed him eyeing me, and we decided to throw elsewhere, without incident. 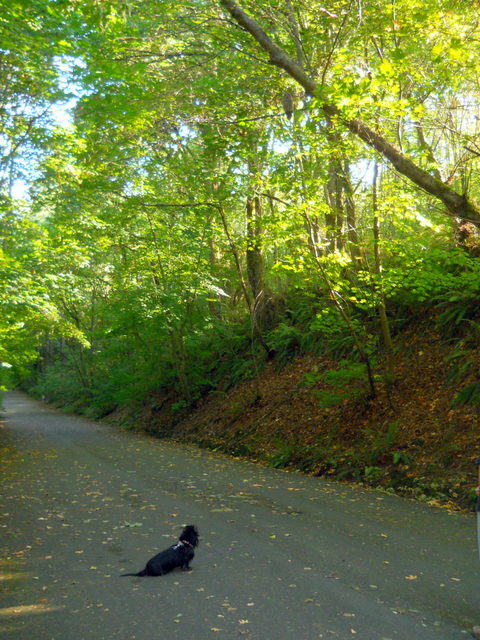 But this week, two times Mike and I were minding our own business, playing fetch on Chloë’s Lane, when he swooped in out of nowhere, catching my eye and trying to taunt me into dropping my ball and charging at him with a barrage of barks. The first time it happened Mike got nervous, and we fled the scene after a measly dozen throws. We returned to the same spot the next day, and after Mike decided the coast was clear, we were up to about 30 throws when the owl swooped in and perched on an alder tree about 10 feet above the trail. As the owl watched me, Mike moved closer and snapped a photo. Then the owl left its perch and flew down even closer, flapping his entire 5-foot wingspan so violently that we could feel the breeze on our heads. Mike yelled at the bird and waved his arms around to scare it, and the owl flew off to a another nearby alder, where he again sized me up as a potential dinner engagement. Mike had seen enough, however, and he called me to follow him towards the front of the Headquarters Building. I wasn’t about to argue, but at the same time, I did not at all think this would be my last encounter with this dirty bird. A barred owl buzzed us again last week, and in practically the same spot in the park where it happened the last time. I think it was last spring, but I’m not sure. This time, Mike had his camera. Heather thinks this was the same owl as last time, but Mike isn’t so sure. I like Heather’s story better. As we approached, unaware of his presence, the owl left its perch and flew just above our heads and landed on a slightly higher branch. Then he stayed there for quite a while as we watched from below. Several other walkers, joggers and bikers passed underneath him, and he checked out all of them, pivoting his neck around with nothing but his eyes moving. He was still there when we got tired of sitting around and walked away uphill. He had clearly decided I was too heavy to carry away, especially with two brave bodyguards to protect me. Heather took me back to that spot on our walk the next morning to see if he was still there, but Mr. Owl was no longer lurking in the vicinity. Based on the number of little critters that my nose detects around there, I expect he’ll be back.